You know those moments of introspect, when you learn something disheartening about yourself? Those "oh crap! Am I really like that?" moments. Those are fun, right? Well, when I have those moments, I am often convicted of the fact that I really don't live with joy. I complain about things when they aren't perfect, I'm grumpy when things don't go as planned, and even when I'm having a good day, it's easy to just float through in my own little world. I have been given so much! There is absolutely no excuse for grumpiness, lingering anger, or even just floating through. For those of us who know Jesus, the only life we should be living is a joy-filled one. But what if we don't feel joyful? How do we change that around? 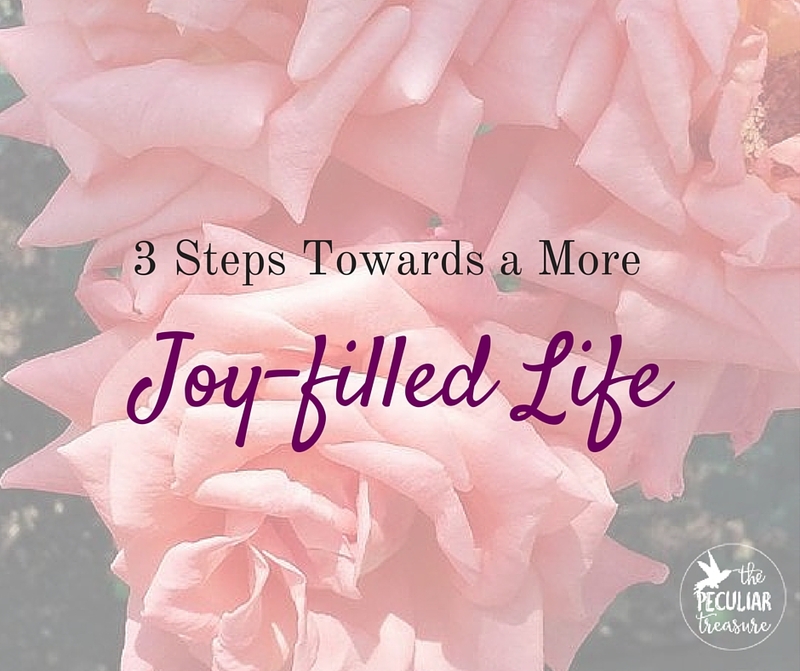 Today, I am sharing 3 steps that can help you start living a more joy-filled life. My mama has always told me that when we praise God, things tend to change in our hearts. When we are stuck in a rut and only thinking of ourselves (which is usually when we are joyless, coincidentally) if we decide to praise God instead, we will find much more peace and joy. Praising God takes the focus off of us and puts it onto God and His goodness. Psalm 100:2 says "Serve the Lord with gladness! Come into His presence with singing!" And I think that this is an indication that serving the Lord can actually cause joy. Sure, serving can be hard work, but if we are serving for the right reasons (A.K.A. for God's glory and sharing His love with others), serving can actually become fun, beautiful, and joy-filled. Serving God and serving others reminds us of how big the world is, how minuscule most of our problems are, and how good we really have it. In my eyes, it is absolutely clear that we have a big part in cultivating godliness in our lives, and living in godliness is living by the fruit of the Spirit. 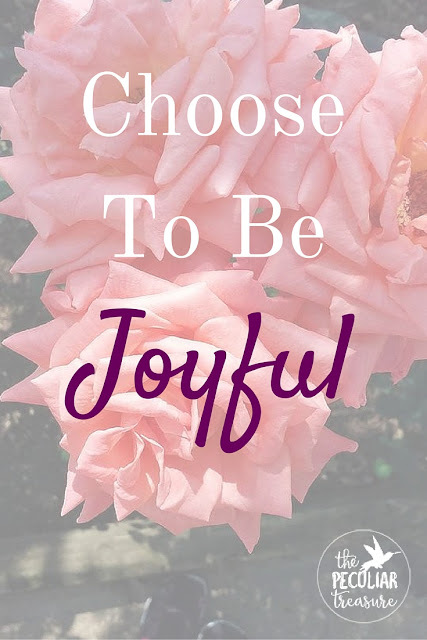 So when we aren't feeling joyful, it is our responsibility to both ask God to provide joy and for us to choose to be joyful. We often say that we cannot change how we feel. Sometimes, that's true. We don't always have the strength to snap our fingers and say, "Ok, I'm joyful now" (that'd be the coolest talent ever though! ), but we do have the ability to say, "I will be thankful, I will praise God, and I will remember His goodness". That should jump-start our joy meter pretty well if we are truly focusing on doing those things. With all the above said, living a more joy-filled life is not a formula. Sometimes, even in service to God, we struggle to find joy. Sometimes, we can't seem to bring ourselves to praise Him. But trust me, if you (we) live these things out consistently, and don't give up, our joy will increase. It may not be overwhelming, but it will happen. Praising God genuinely for all He's done and who He is, serving God with right intentions, and making up our minds to be more joyful will all work together to actually create that joy we've been longing for. God will give us joy if we live in godliness before Him and have our hearts turned in the right direction! Choose! It's definitely key. Great reminders here today. I'll admit I used to do a lot of community service but have been kind of slacking lately. It was easy in college because I felt I had to do it for my clubs and such. t really did bring me joy at the time. I need to find something that I enjoy in my new environment - at home ! I help out with Trevor's fire dept. at time. Maybe I'll get more involved with that, or at the school. I really appreciate your thoughtful reply, Chelsea! I'm so glad that it was a blessing to you, Marci! God often brings us to exactly what we need. I'm definitely too grumpy sometimes. I try not to be but life gets to you! But I am also very blessed and try to remember that. It's easy to slip into! Recognition is the first step though, so that's good! Thanks! I'm glad you could relate! This is something I really needed today! Praise God! I'm so glad it was a blessing to you, LeighAnn! I agree, Lauren! It's so important that we realize that we are responsible for our own actions! My word for this year was joy but I feel like I put it on the backburner so choosing to be joyful probably hit me the most and something I need to work on! I totally understand. It's never too late to start again! Just decide that you will do better from this moment on! You are not alone, that's for sure! Three things that are so very important in our christian lifestyle that will led us to joy. Great post! Thanks for sharing!